We want to develop a personal relationship with each customer and help provide the maximum value of your motoring budget. First Green Shop in California! Saddleback Cars is recognized for our efforts to reduce the generation of hazardous waste by using environmentally-friendly techniques in the auto repair industry! Looking for a repair shop that really cares? Saddleback Cars strives to provide great stewardship on all levels. It may be you operate just your own car or manage a fleet of vehicles, we can help. 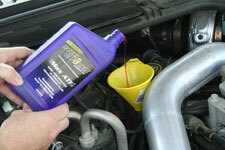 Our unique approach using exclusively Royal Purple synthetic oils protects your vehicle better and reduces your costs. The products Extreme film strength reduces friction greatly. In plain English…everything moves easier! This makes more horsepower, reduces operating temperatures, extends wear life and improves FUEL ECONOMY! Extended service intervals lower your basic service costs over time as well. Thinking GREEN, Saddleback Cars is the FIRST approved auto repair facility in the state of California to be granted the “Green Station Recognition”. We are here to help solve your vehicle service needs in a responsible manner. Whether you are a serious environmentalist or just think it’s better to do the right thing, please contact us to see how we can help you. If you are IN a “green” business or advertise your company this way, shouldn’t you have your vehicles serviced at an awarded green shop? Let us help you fulfill your goals of vehicle maintenance with environmental responsibility. We can perform factory-scheduled maintenance, such as oil changes, minor and major services, tune-ups, etc, to maintain your car's warranty, and keep the car in the best possible shape. Should your vehicle ever need more extensive repairs such as power train, chassis or electrical, we handle it all. We know the importance of keeping up with today's demands. The auto-industry is evolving every day, and we keep up-to-date with all of our technology so we can pinpoint the problem and resolve it right the first time - every time. We want to provide you with the best possible service we can. We have access to rental vehicles for you to use while we are performing any major work (rentals are available upon request). Factory Scheduled Maintenance, from oil changes to major repairs. You deal directly with the owner at every phase of the estimate or repair. Our credentials symbolize our commitment to our customers.